Food insecurity at the Massachusetts Institute of Technology (MIT) had been both poorly understood and oftentimes neglected until very recently. I think the overwhelming view of the administration was that students were, in general, getting enough to eat through the campus meal plans or retail dining options at the student center or elsewhere. Progress towards addressing food insecurity on the campus only began in summer 2017, with the creation of the Food Insecurity Committee that put students, staff and faculty together to combat the issue. About a month later, Class Awareness, Support and Equality (CASE), a student-led organization that deals with issues of class, released the results of a survey that showed, among other things, that around 11% of students are food insecure. That MIT’s rate of food insecurity was no lower than the national rate really brought the issue into the limelight, prompting a slew of solutions. Among these is the newly implemented SwipeShare. SwipeShare is a program conceived by the MIT Undergraduate Association in partnership with the Department of Student Life, where students can donate unused guest swipes from their meal plans into essentially a swipe bank. Students that are food insecure would then be able to contact Student Support Services to access these swipes. 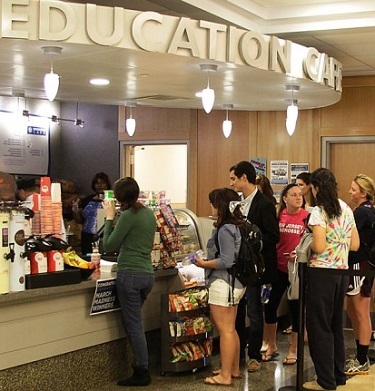 In the future, students will be able to donate any meal swipes, not just guest swipes. CASE is also working on the issue: We are piloting a program where students can get food baskets for the winter session generously donated by the MIT Women’s League. We are also working to develop a food series for cooking for yourself under a budget. Finally, we have an active student representation both in the Food Insecurity Committee and in the newly formed Accessing Resources at MIT (ARM) Coalition to ensure that proposed solutions are in accordance with students’ needs and circumstances. Although it is encouraging to see real progress being made on many fronts, work remains to be done. For many students, it is difficult to tell someone that they are struggling financially, let alone ask for help. All the solutions in place at the moment require a student to talk to MIT staff, creating a potential barrier for some. Moreover, none of these solutions make it any more affordable to dine on campus or buy groceries, an issue compounded by the recently announced closure of local grocery store Star Market. Many fraternities, sororities and independent living groups organize group cooking plans, so they are sure to be impacted by the scarcity of grocery shopping options at MIT. Still, it is immensely gratifying to see an issue that our organization has consistently fought for for the better part of a year recognized by the administration as a problem that we can work to eradicate. Through continued engagement with them and with the MIT student body, CASE has taken an active role in achieving this goal. As patchwork turns into real, permanent solutions, we hope to see that no student at MIT goes to bed hungry. René is a civil and environmental engineering student at MIT. There, he has been involved in numerous initiatives that promote wellness and equality. He's also interested in public policy and governance and is very involved in his living group, Theta Delta Chi. René is a researcher at the Resilient Infrastructure Networks Lab, president of Class Awareness, Support and Equality, and has been involved in public service projects through the MIT Public Service Center. He is an avid nonfiction reader, moviegoer and video game player.